It appears like Microsoft is keen on keeping up with its Vista amends, and the company’s latest roadmap confirms this. 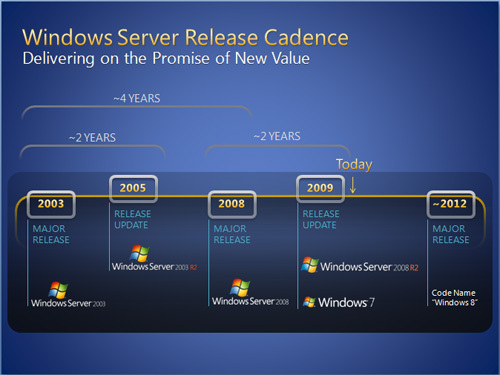 According to the roadmap, the OS currently referred to as “Windows 8” should arrive in 2012 and Microsoft is keeping up with its tempo of 3-4 years per major release. Judging by the roadmap, the company doesn’t expect any delays. This could be due to the fact that Redmond is diligently working on it, or that the new OS will just be a 7 with a few new wallpapers, useless graphics-hog eye-candy and a reshuffling of all your familiar settings, so that you have some “fun” while you’re at it.